Oct 22 – Oct 26 North of Dublin-Granville Rd. Oct 29 – Nov 2 South of Dublin-Granville Rd. Nov 5 – Nov 9 North of Dublin-Granville Rd. Nov 13 – Nov 16 South of Dublin-Granville Rd. Nov 19 – Nov 21 North of Dublin-Granville Rd. Nov 26 – Nov 30 South of Dublin-Granville Rd. 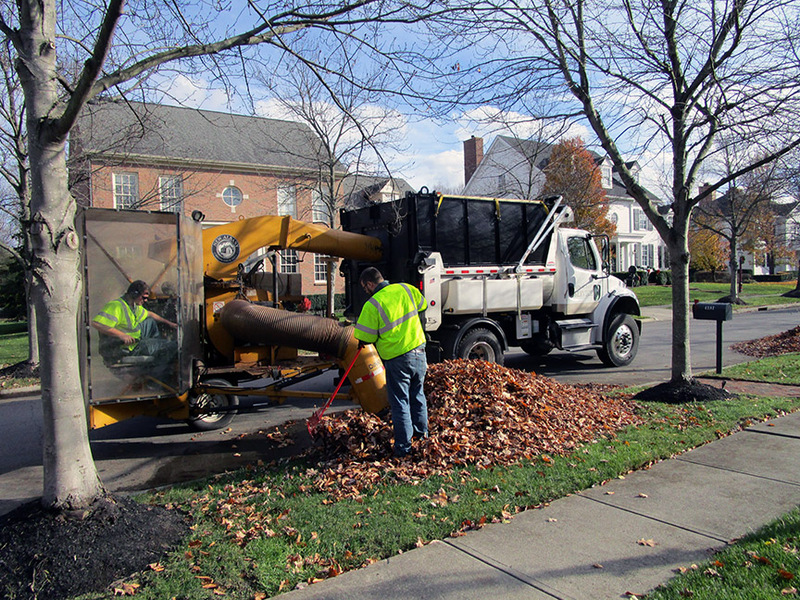 Service crews collect leaves that have been raked into piles at the curb or in the tree line. Leaf vacuum machines are pulled by trucks housing large volume boxes for collection. These trucks will pass each New Albany home to collect leaves at least five times and collect more than 500,000 pounds of leaves. Please call 614-855-0076 with questions. Please rake leaves to the edge of the road or to the back of curb but not in the street. Avoid placing leaf piles near mailboxes, trees, lights, signs or shared public areas. No branches, twigs or grass clippings will be collected, only leaves. Leaves under or behind parked cars cannot be collected. Avoid parking in the street until after leaves have been collected. Leaves will be collected on a weekly basis in alternating zones, with areas south of Dublin-Granville Road collected one week and areas north of Dublin-Granville Road collected the next week. Place leaves at the curb before 7:00 AM on the Monday of each collection period. The Public Service Department cannot guarantee collection of leaves placed at the curb after this time for the given collection period. Please keep leaves out of storm water sewers and stream banks. Leaves cause bacteria that depletes oxygen and can kill fish and other stream organisms. Leaves can also be collected during scheduled yard waste collection dates if they are placed in paper yard waste bags or in a container marked “yard waste”; or leaves can be taken to the nearest yard waste drop-off facility: Kurtz Bros. Please wait until the next weekly collection pass as a courtesy to other neighborhoods. Crews can not return to a street after they have completed a pass. The New Albany Leaf Collection Program is intended only to collect leaves that have been properly bunched and placed at the curb within the right-of-way for disposal during a two month period from mid-October to early December. There is a very small window of opportunity to collect the leaves from the time they fall until winter weather begins. Once the leaves are covered by snow or are frozen, the leaf vacuum machine cannot collect them and service crews must attend to snow removal operations. Utilize a mulching lawnmower and mulch leaves back into the lawn. This provides nutrients for the soil. Place leaves in and around plant beds and under trees and shrubs. This provides good nutrients for the soil and insulates the plants. Utilize New Albany’s weekly yard waste collection service by placing leaves in biodegradable bags or containers labeled “yard waste” and placing them at the curb during refuse collection. Leaves will be collected in your neighborhood at least five times from October through early December.